There are some plates of food that when presented in front of you you are a little bit sceptical that the dish will actually taste good. This dish, being predominately grey and black with only a splattering of green and white from the spring onions and the delicate pink from the salmon, is a case in point. You are going to have to trust me on this one when I say that this meal is seriously delicious. It also ridiculously quick (I know I know I say that with most of the dishes I put up on my blog) – it takes the amount of time that you cook your salmon in the oven – 15 minutes. Black sesame seeds may require a bit of effort to hunt down – I found mine at my local Asian grocers, but other than that you should be able to get hold of the rest of the ingredients pretty easily. If you don’t have tamari, just use soy sauce – they are very similar. 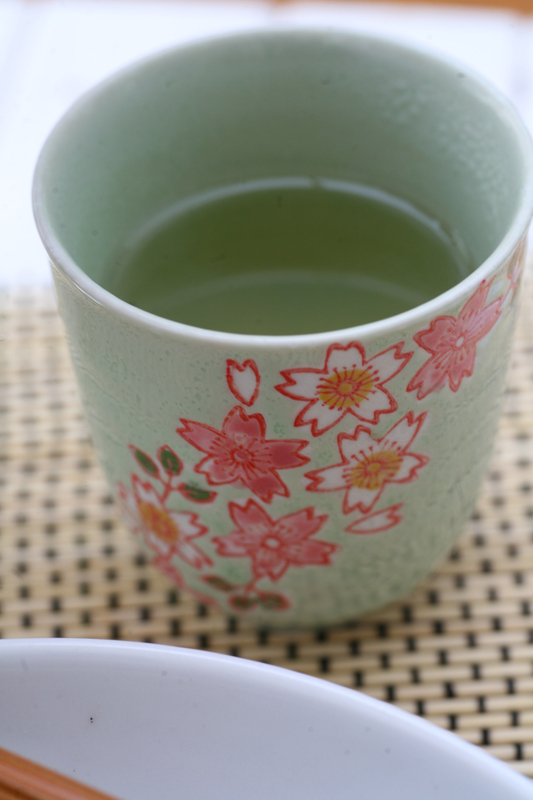 I ate mine with a hot cup of fresh lemon verbena tea, which I have become rather addicted to since I was sweetly given a bag full of the stuff last weekend. Have you tried it before? Does anyone grow it in their gardens? Is it easy to maintain? I’d love to know as lemon verbena has a wonderful aroma and taste. I hope you get to try this dish very soon. 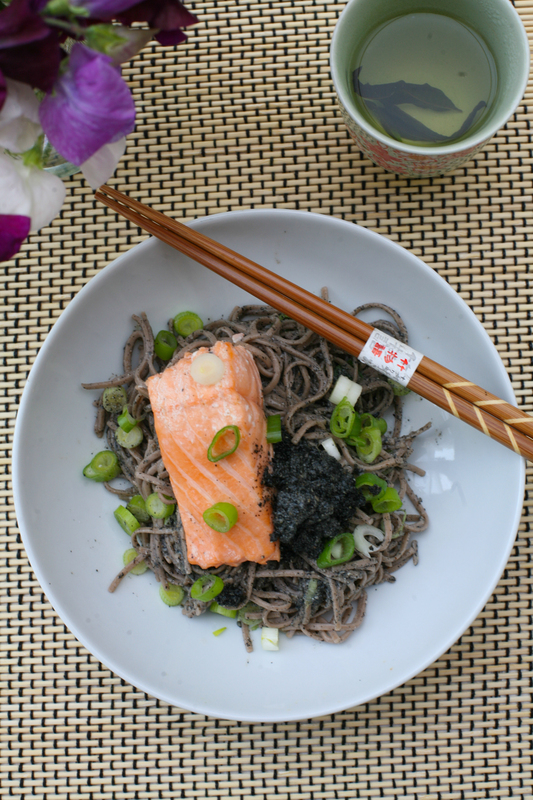 I adore buckwheat soba noodles – I tend to buy the Clearspring variety – they look like this. They’re wheat free noodles, low in fat and a great source of protein and fibre. Go on give this dish a go and leave me a comment below. 1. Preheat your oven (I use a fan oven – if you are not increase the temperature by 10 degrees) to 180 degrees. Equally you can steam the salmon if you prefer. Using a cooking brush gently wipe each salmon fillet with sesame oil. Place in a non stick dish and cook for 15 minutes. 2. Meanwhile, in a frying pan dry roast, on a low heat, the pine nuts and sunflower seeds for a couple of minutes so they begin to bronze. You will need to keep moving the pan to prevent burning. As the pine nuts begin to bronze add the black sesame seeds and move them around the pan for a minute. Transfer to a spice grinder (or pestle and mortar). 3. After whizzing the ingredients for 10-15 seconds so that they are properly blended, transfer the paste into a mixing bowl and add the remaining ingredients to make the black sesame paste. Place to one side. 4. Place the soba noodles in a pan of boiling water and cook according to instructions – should be around 5 minutes on a low heat. Before draining save 100ml of the noodle water and leave in a jug. Drain the soba noodles and run under cold water to prevent further cooking. Before adding the soba noodles to the black sesame paste, remove 1/4 of the paste and place in a separate cup. Add the soba noodles to the large mixing bowl with the remaining black sesame paste, the 100ml of noodle water, extra virgin olive oil and almost all of the spring onions and gently stir into the paste. 5. 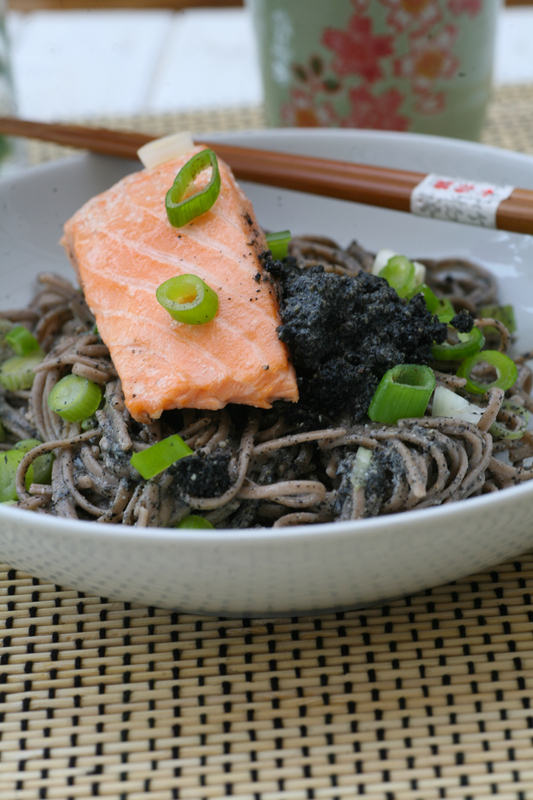 Serve a generous portion of noodles to each bowl or plate and place the salmon fillet on top along with a dollop of remaining black sesame paste which you have reserved and a scattering of spring onions. It can be eaten at warm, room temperature or cold. You can replace the salmon with trout or even with tofu gently fried. It would in fact make an original and tasty lunch box alternative. 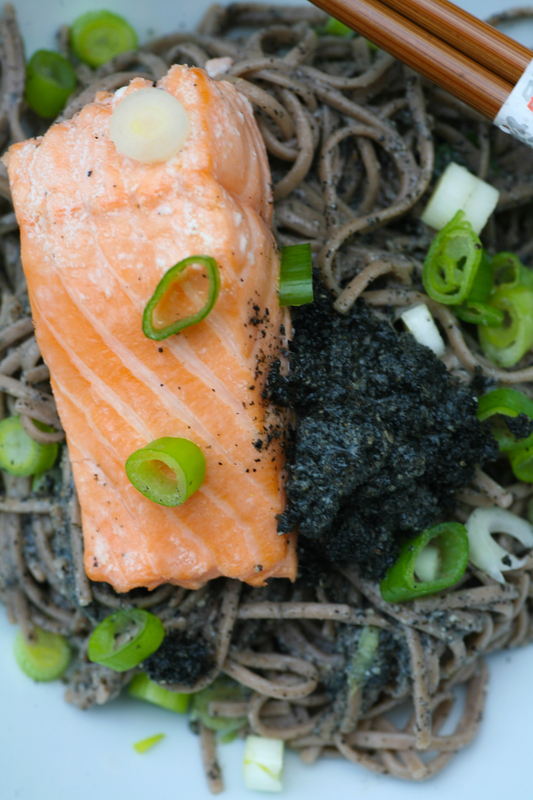 This entry was posted in Fish, noodles, Tofu, Vegetable, Vegetarian and tagged black sesame seeds, fish, Heidi Swanson, lemon verbena, noodles, salmon, soba noodles, spring onions, tamari. Bookmark the permalink. I love the look of this – really dramatic…which I’m sure the flavours are too. Thanks Sally. So glad it appeals as I realise it does looks a little grey and black. The flavours are magical. I remember the first time I tried it my husband and I were quite taken back that it tasted so good.